Look at this before it changes colour and disappears forever! It's the Chameleon - our brand new kigurumi onesie costume. It's designed to fit adults between 5'6" and 6', and it's made of a super-soft and warm polyester fleece. Oh yeah, and it's completely flipping amazing! Like all of our kigurumis, the animal's face appears on the hood. With the chameleon, that means some great big eyes with frilly details and padded eyebrows to give the shape of the chameleon face. The main colours are green and orange (any chameleon's favourite two colours), and there are various multi-coloured elements included as a nod to the chameleon's amazing colour changing super-powers: each of the buttons are a different colour, as are each of the cuffs (ankle and wrist), and there are various coloured pimples around the shoulder area. Pretty cool eh? 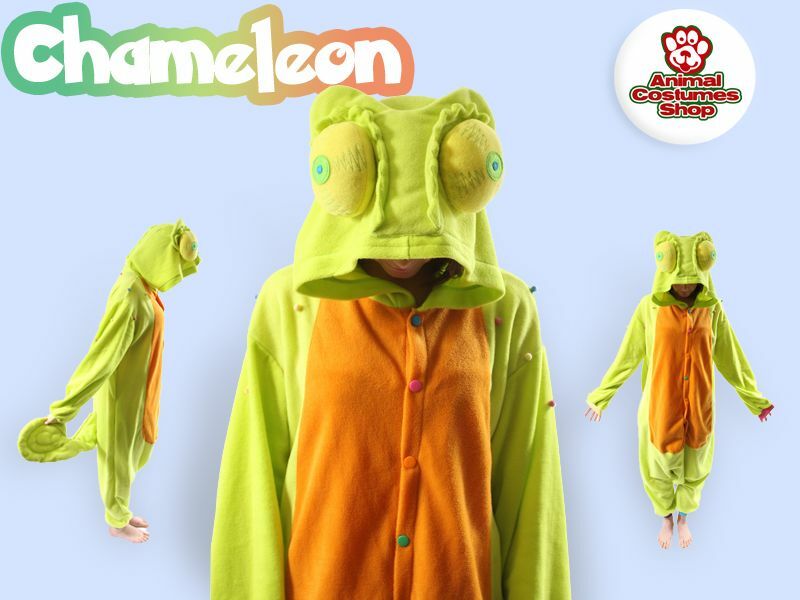 Click here to get the chameleon kigurumi costume.